The University of Limerick (UL) has recently launched its ambitious Research & Innovation Strategy for 2020. A key component of the Excellence & Impact 2020 strategy is the definition of the University’s key strengths and cornerstones to ensure sustainability. Advanced Manufacturing is recognised as one of those areas of research strength for the University and the intention is to continue to leverage and enhance this foundational impact area. To ensure Manufacturing can continue to build on its strengths and cement its future as a cornerstone of UL Research and Innovation, a strategy is required to align stakeholders on its preferred future, scope and key focus areas. 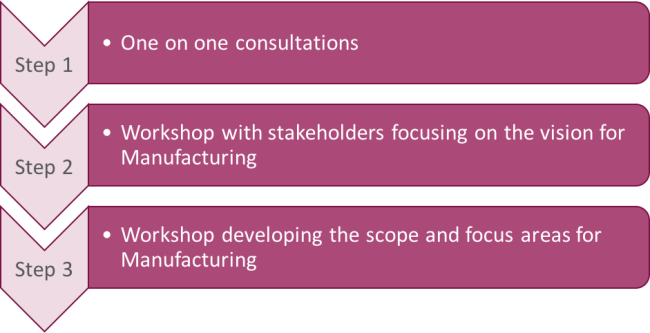 The group identified the key strengths and competencies within Manufacturing and defined the key enabling areas for their 2020 strategy that will drive this area of research and innovation.